Did you know?… There are several kinds of errors on Wyoming quarters that relatively few people know about. These error coins are worth a significant sum of money. 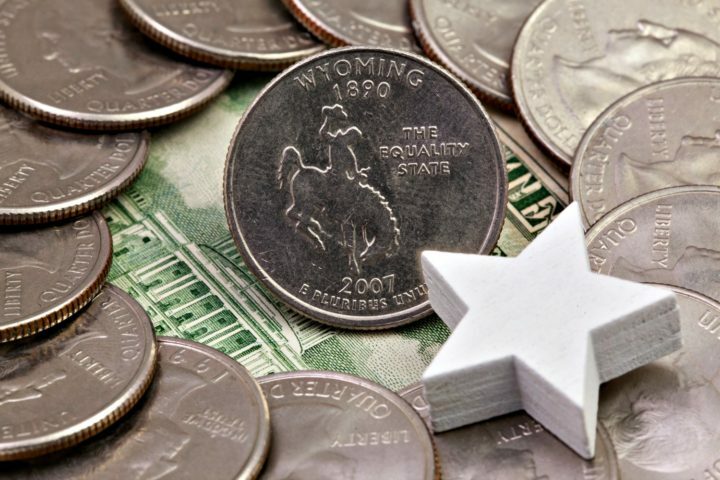 If you know what to look for, you could score big by finding a scarce and valuable Wyoming state quarter error in your pocket change! In 2007, the Wyoming quarter was released as part of the 50 State Quarters program — which spanned from 1999 through 2008 and became one of the most popular and ambitious commemorative coin programs the United States Mint ever released. Some 50 State Quarters were made with errors or varieties, and among these are the Wyoming quarters. How Much Are Wyoming State Quarters With Errors Worth? It’s time to start searching through your loose change and bank rolls of quarters for some fun error coins. Some of the 2007-P Wyoming quarters made at the Philadelphia Mint were struck with a doubled die reverse that shows some minor doubling around the saddle. Values for this doubled die coin range from $3 to $7. A little gross, maybe, but there’s an interesting die break on some Wyoming quarters between the rear of the horse and its tail that makes it look as though the horse is doing its business. (Yep… Really does look like that!) It’s just a die break — but an unfortunate one. Wyoming quarters with this strange die break (some calling it the pooping horse error) are worth $15 to $25. There’s a really peculiar die break that shows a long, crooked line from the tip of the horse’s front hoof all the way through both zeros (“00”) in the date, the “S” of “PLURIBUS,” up to the coin’s rim. Examples of this error normally sell for between $3 and $10, depending on the coin’s condition. Some collectors have found what appear to be die cuds (die breaks hanging off parts of the design) on Wyoming quarters. Values for these coins range are based on the size of the cud and condition of the coin. They are generally worth $2 to $5. Even if you can’t seem to find any of the Wyoming state quarter errors right away, don’t give up. They’re out there. You may not hear much about these particular error quarters, and they’re not necessarily worth a ton of money right now — but these error coins are still worth looking for. Chances are you have some Wyoming quarters without any errors. Wondering what those are worth? 2007-P Wyoming quarter — A total of 320,800,000 were minted at the Philadelphia Mint and they are worth face value if found in pocket change due to the circulation wear. Uncirculated examples are worth about 50 cents and up. 2007-D Wyoming quarter — A whopping sum of 243,600,000 Denver-minted pieces were struck and, like their Philly counterparts, are worth only fave value if worn. Mint State examples are worth about 50 cents or more. 2007-S copper-nickel clad proof Wyoming quarter — Some 2,374,778 cupro-nickel clad proof coins were made at the San Francisco Mint and for collectors and are worth about $1.25 to $3 apiece. 2007-S 90% silver proof Wyoming quarter — The San Francisco Mint struck 1,313,481 examples of the 90% silver proof, and these are worth around $4 to $10 each. The 2007 Wyoming quarter is the 44th coin issued in the 50 State Quarter series. The nation’s 44th state entered into the Union on July 10, 1890. The state’s nickname, “The Equality State” is emblazoned on the reverse (tails side) of the coin and earned this moniker — because it was pioneering in granting women the right to vote, serve on juries, and run for public office. Wyoming elected Nellie Tayloe Ross in 1924, making her the first female governor in the United States, who later served as director of the United States Mint from 1933 through 1953. The reverse design of a bucking horse and rider, symbolic of the Wild West, was created by Norman E. Nemeth. The obverse (heads side) design was originally completed in 1932 by John Flanagan and modified in 1999 by William Cousins. 3 Rare Kansas Error Quarters To Look For!